The Olmecs were the first people in the Americas who developed monumental architecture of sophisticated style stone sculpture. 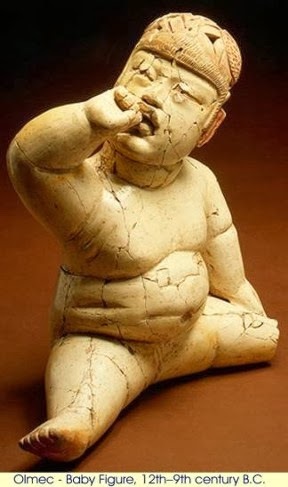 The Olmec civilization originated in the lowlands of south eastern Mexico between 1500 and 400 BC, it’s heartland lying on the Gulf Coast of Mexico, an area measuring around 275 km east to west and extending about 100 km inland from the coast within the states of Veracruz and Tabasco. This civilization was considered to be the first civilization which developed in Mesoamerica with its heartland being one of the six cradles civilizations worldwide, while the others were Chavin culture of South America, the Shang culture of China, the civilization of Ancient Egypt, the Indus Valley Civilization of South Asia and the Sumerian civilization of ancient Iraq. It was only the Olmec civilization which developed in the setting of lowland tropical forest. Evidence of Olmec writing was found in the first decade of 21st century with the earliest findings of Olmec hieroglyphs dating around 650 BC. Some script has also been found on roller stamps as well as stone artifacts where the text was short and partially deciphered based on the similarity of other Mesoamerican scripts. Moreover the evidence found on complex society developed in the Olmec heartland has given rise to the belief that the Olmec were regarded as the Mother Culture of Mesoamerica though this remains to be controversial The Olmecs developed cities as early as 1200 BC which were defined as population centers with political and cultural influence and significance. The major urban area of the Olmec in early times was San Lorenzo, the largest city in Mesoamerica at that time and was probably a political and a ritual place which housed thousands of inhabitants with elaborate drainage and water systems. 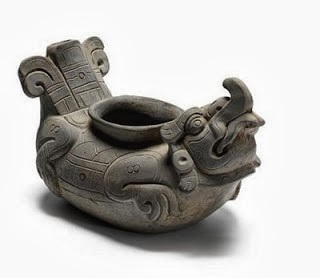 The influence of talented traders and artists are seen in later cultures of Aztec and the Maya. The Olmec cultures which developed in the 1200 BC and declined around 400 BC have very few written records relating about their culture. The Olmec artifacts at first were thought to be Mayan where they were presumed to be the first great culture in that area. They also had very talented artists portrayed through their colossal heads which are intriguing, leaving behind a lasting artistic legacy. These colossal heads indicate the head and face of a helmeted man having indigenous features with most of the heads taller than an average human man. 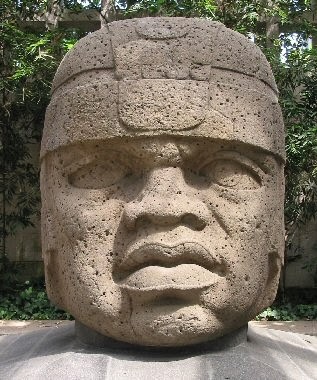 The biggest colossal head found at La Cobata stands around 10 feet tall weighing around 40 tons and while the heads are flattened at the back, they are not carved all around indicating that they could be viewed from the sides and the front. Evidence of some plaster and pigments on one such head at San Lorenzo indicate that some paint could have been used on them. A total of seventeen Olmec Colossal heads have been located, with ten such heads discovered at San Lorenzo, four at La Venta, two in the area of Tres Zapotes, and one in the vicinity of La Cobata. The Olmecs carved stone, jade and volcanic rock basalt and these were quarried as well as imported. Basalt boulders and blocks which were located around 50 miles away were used to carve the heads and archaeologists suggest that it was a tedious process of moving the stones slowly with the combination of manpower, sledges and the possibility of rafts on rivers. When the stones reached a work place, they were usually carved with the help of crude tools like stone hammers since they did not have any metal tools, making this sculpture all the more intriguing and unique. Once the head reached completion, they were moved into position though there were possibilities of them being occasionally moved around for creating scenes with other Olmec sculptures. The exact meaning of the heads is unknown though there have been several theories related to them. The size and majesty suggest that they could have represented gods but this seemed invalid since Mesoamerican gods in general were depicted more gruesome than human beings. Moreover the head dress or the helmet portrayed in their carvings suggest that they could be ball players but archaeologist believe that they represented individual rulers since there is some evidence on the faces with distinct look and personality indicating individuals of great power and importance. The ancient Olmec is often remembered due to the massive stone heads that have been found and they developed many things culturally as well as religiously which were later used by the Aztecs and Mayan as well as other cultures. They had a rich society, ate a variety of food and traded with far away people. The most accepted presumption is that the culture rose from people in that area though some believe that the Olmecs may have come from Africa.